“Woolly Bears in the Snow” sounds like the title of a fun children’s book. However, this month CNC received a call about a Woolly Bear caterpillar on the snow. Surprisingly it is not uncommon for CNC naturalists to receive calls in the late winter about caterpillars, cocoons or moths. Most frequently the calls are about giant cocoons that appear suddenly on top of the snow crust in February or March. Moths and butterflies use a variety of survival tactics when faced with our frigid Midwestern winters. The most well-known is the 3,000 mile Monarch Butterfly fall migration. These *wise* creatures escape before winter turns brutal. But not all moths and butterflies undertake such an arduous journey. Mourning Cloaks prefer to stay right where they are, over-wintering as adults in the shelter of barns or tree holes. Other species of moth and caterpillar overwinter as eggs, pupa (chrysalis/cocoon) or caterpillars. 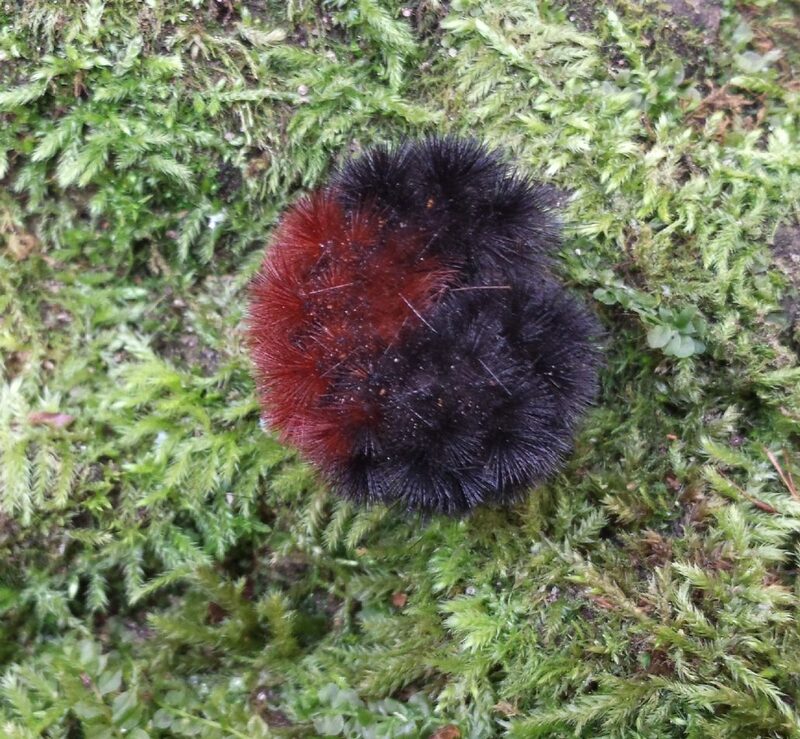 In the case of the Banded Woolly Bear, the caterpillar spends the winter dormant under the leaf litter beneath an insulating blanket of snow and ice. Dormant is a nice way to say that these tiny insects are equipped to survive freezing. They produce large quantities of glycerol, a cryoprotectant, which keeps their cells from rupturing when they freeze. In the spring the Woolly Bears become active, form a cocoon and metamorphose into the Isabella Tiger Moth (Pyrrharctia Isabella). A relative of our Woolly Bear, the Arctic woolly bear moth (Gynaephora groenlandica), actually has a life cycle that involves repeated freezing and thawing. Due to the harsh conditions in the Arctic Tundra, and the short growing season, it can take up to 14 years for the Arctic Woolly Bear Moth to grow from an egg into a moth. That is the longest life cycle of any moth or butterfly. If you find a Woolly Bear caterpillar or a silk moth cocoon in the winter, do not bring it inside. If it warms up during the wrong season there will be nothing for it to eat, or in the case of the silk moth, no other moth to mate with. Odd as it sounds, the best thing for these amazing insects is to leave them out in the cold. Wood Thrushes, Blackpolls and Windows Bird Brains or Brainy Birds?